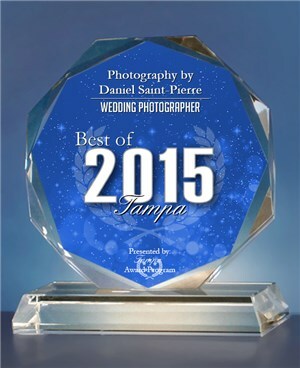 TAMPA July 2, 2015 — Photography by Daniel Saint-Pierre has been selected for the 2015 Best of Tampa Award in the Wedding Photographer category by the Tampa Award Program. Various sources of information were gathered and analyzed to choose the winners in each category. The 2015 Tampa Award Program focuses on quality, not quantity. Winners are determined based on the information gathered both internally by the Tampa Award Program and data provided by third parties. Posted in Uncategorized and tagged award, award winner, award winning, best of St. Petersburg, best photographer in St. Petersburg, best photographer Tampa, best photographers, best St.Petersburg, Christian Photographer Daniel St Pierre, Daniel St Pierre report, Daniel St Pierre review, Photographer Daniel St Pierre report, Photographer Daniel St Pierre review, Photographer Daniel St Pierre rip-off, Photographer Daniel St Pierre ripoff, winner, winning.